At first I thought the aunty quality of being nurturing, comforting and making your business their own was a uniquely Singaporean thing, given that all of the aunties in my life are from Singapore. But since publication of the first two Aunty Lee books I’ve received feedback that Aunty Lee has embodied characteristics of readers’ Jewish / Non-Resident Indian / Catholic-Raised / American Born Chinese relatives so perhaps aunty qualities cover a much wider range! 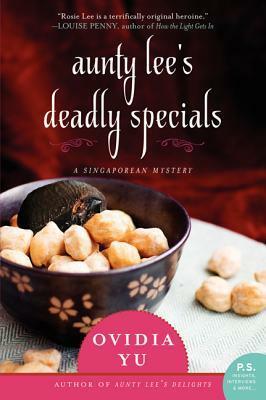 And of course, in addition to cooking and minding other people’s business, Aunty Lee solves murders. The inspiration for that came from the books I grew up loving and still read. Agatha Christie, of course. Also Rex Stout and Sherlock Holmes in the hands of Arthur Conan Doyle and Laurie R King. Some of my currently best loved writers are Louise Penny, Donna Leon and SJ Rozan. Their books make it abundantly clear how well they know and how much they love rural Quebec, the waterways and old buildings of Venice, and the brownstones and Chinatown of New York. The example set by these authors made me want to see whether I could do the same in my own backyard. And trying to capture Singapore through Aunty Lee’s eyes has made me re-examine my views towards this City-State which I’ve taken for granted till now, much the way I took my parents, neighbourhood and school for granted. I’ve disagreed with the way some things are done here - probably in much the same way as adolescents disagree with elders they consider old fashioned and over strict - but, like a responsible parent, Singapore has provided a safe space from which to explore the world. Aunty Lee takes full advantage of that, exploring people and places via their favourite foods. The human need for food is as universal as the human horror of murder, which is why I find the juxtaposition interesting.